A study being conducted by the Wayne State University School of Medicine's Department of Emergency Medicine is one of four finalists vying for a $150,000 prize from GE Healthcare. "The Impact of Noninvasive Positive Pressure Ventilation on Left Ventricular Strain in Acute HF" is one of four studies named finalists in the 2017 GE/EMF Point of Care Challenge. The four were selected from submissions worldwide by the American College of Emergency Physicians Scientific Research Committee. Now, members of the ACEP community can vote for "the most innovative" research proposal. The proposal receiving the most votes will secure an additional $150,000 in research funding from GE Healthcare and the Emergency Medicine Foundation. Only votes from ACEP community members will be counted toward the final award. You can vote for the WSU study here. Voting concludes Nov. 3. The challenge, when concluded, will have provided $500,000 in cash and equipment in a global competition to develop breakthrough applications of ultrasound at the point of care in the care of patients in shock or trauma, or to improve the use of ventilator technology. Each of the four finalist studies have already received $50,000 from GE Healthcare. 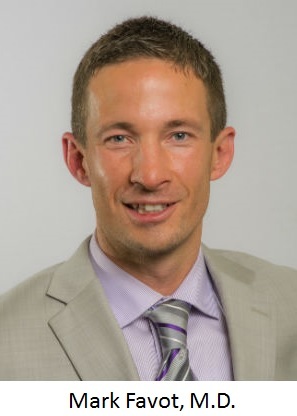 Acute heart failure is a leading cause of hospitalization worldwide, yet despite a significant commitment from the research community, post-discharge outcomes have remained largely unchanged during the past 20 years, said Mark Favot, M.D., clinical assistant professor of Emergency Medicine and principal investigator for the WSU study. Rates of readmission and mortality after hospitalization are still unacceptably high, raising the question of whether the homogeneous approach to inpatient treatment is completely effective. Non-invasive positive pressure ventilation, or NIPPV, has been used for treatment of respiratory failure and impending respiratory failure in acute heart failure for approximately 20 years. Despite substantial evidence that the use of NIPPV reduces the rate of intubation and the length of stay in intensive care units, there is very little in scientific literature regarding the effects of NIPPV on the failing left ventricle, said Dr. Favot, who also serves as director of Emergency Medicine Ultrasound Education at Sinai Grace Hospital. Left ventricular strain, measured via echocardiography, has proved a more comprehensive method to describe the cardiac mechanics. Strain can be accurately measured using semi-automated speckle-tracking software on standard two-dimensional grayscale images. Dr. Favot said that to his knowledge, his team is the first to study left ventricular strain in the setting of acute heart failure. Based on "very promising" preliminary data in this first-of-its-kind patient population, he hypothesizes that strain echocardiography will serve as a viable indicator of acute left ventricular dysfunction that undergoes real-time changes with therapy, including NIPPV. "This project will serve as the seminal work on strain echocardiography in the setting of moderate to severe acute heart failure, and will provide clinicians who are looking to treat patients with acute heart failure in a more individualized fashion with the answers on the impacts of NIPPV on the heart that they are seeking," he said.